Back to 1947 Lighthouses. Forward to 1969 Lighthouses. Due to the change to decimal currency on 10 July 1967, a quantity of the 1947 Government Life stamp issue was overprinted by the New Zealand Government Printer with decimal values to ensure there would be enough stock to last through until 1969 when a new set of stamps was planned. Additional supplies were also ordered from Bradbury Wilkinson and Co.
Only six of the original set were overprinted, with either a block spot or bars to cover the old value, with the new decimal value being added elsewhere in the design. I think this left a rather scruffy appearance, made even worse by a large number of printing errors that have been found. This set was one of the reasons why we have taken so long to include the lighthouse stamps in this blog because we struggled to find images good enough to be used. Even these below are not as good as we would have liked but they will do until we find better to use. Anyway, the history of the Government Life Insurance stamps is an important part of New Zealand's postal heritage so they need to be included in this blog. For details on the actual lighthouses go to our post 1947 Government Life Insurance Lighthouses. 1c - Overprint on 1d Taiaroa Lighthouse. 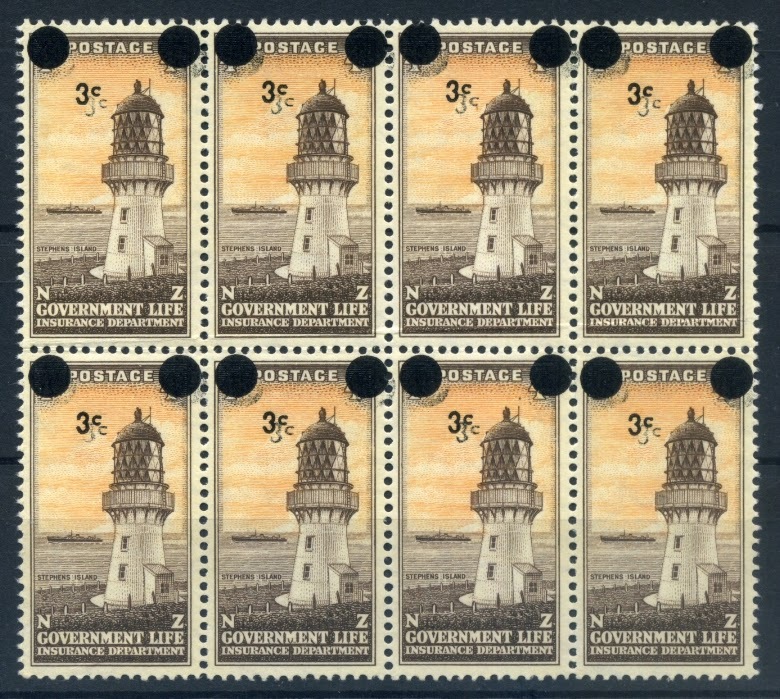 2½c - Overprint on 3d Eddystone Lighthouse. 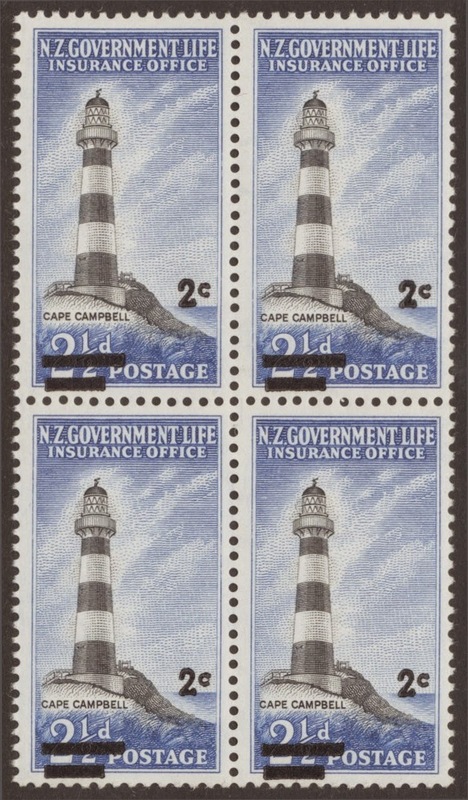 2c - Overprint on 2½d Cape Campbell Lighthouse. 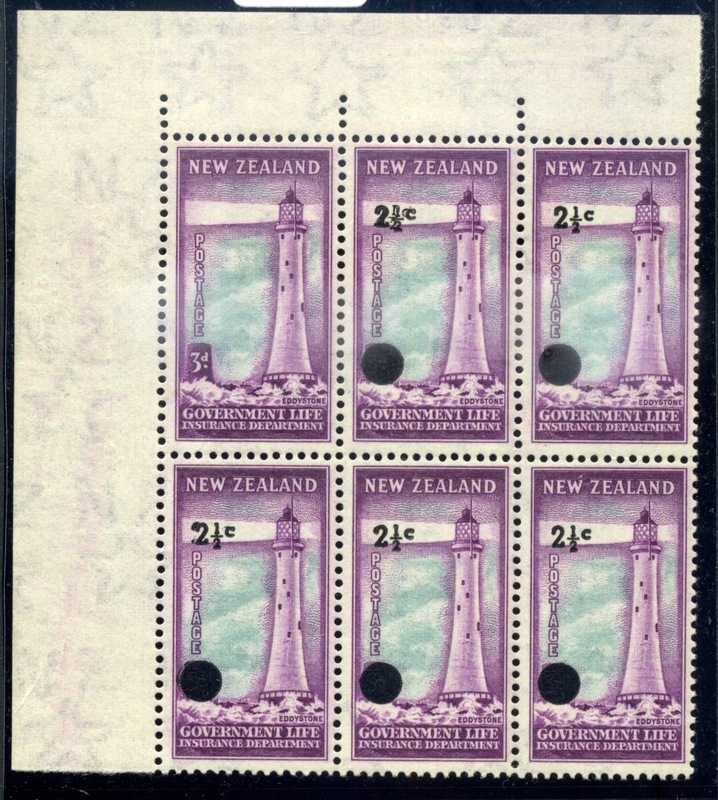 3c - Overprint on 4d Stephens Island Lighthouse. 10c - Overprint on 1/- Cape Brett Lighthouse. 5c - Overprint on 6d The Brothers Lighthouse. Above is a First Day Cover showing all six of the overprinted stamps. What is of particular interest to me is the two postal strikes used. In the top left corner is the hand stamp of the Government Life Office. Over the stamps, themselves is the official cancel of the first day of decimal currency. 1967 Decimal Life Insurance 2½c on 3d Eddystone Lighthouse. On this block of six stamps, the one in the top left corner is missing the overprint completely, while the stamp in the middle top has a doubled image. This is due to the paper being folded during printing. 1967 Decimal overprint 3c on 4d Stephens Island, a block of 8 where the overprinted image has been clearly doubled with a second partly printed image to the lower/right. 1967 Decimal overprint 3c on 4d Stephen's Island, where the overprinted image has been doubled with a second ghost image to the lower/right. 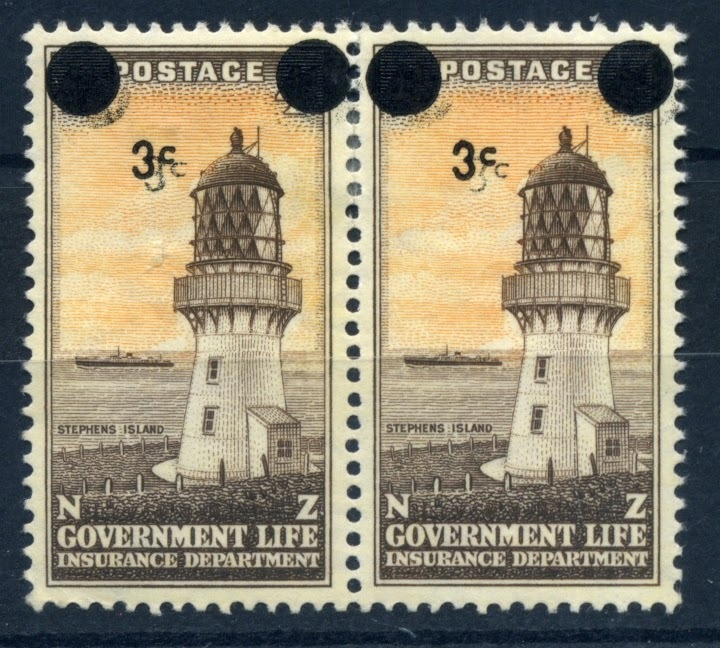 1967 Life Insurance decimal overprint 3c on 4d Stephens Island Lighthouse, with the black dot, shifted to left. Now the left dot runs off the edge of the stamps, while another third dot can partly be seen on the right. 1967 Life Insurance overprint 2c on 2½d Cape Campbell Lighthouse, the black overprint has shifted down so much of the old value can be seen. 2004 - Landscapes of Middle-Earth. 2004 - 2006 Tourism Definitives. 2015 ICC Cricket World Cup.